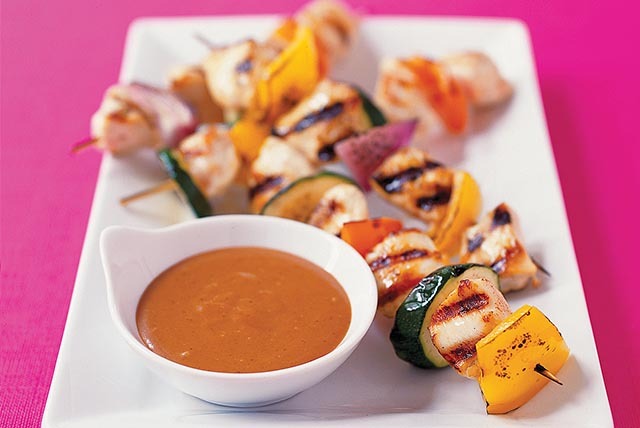 These chicken and veggie kabobs are grilled to perfection and served with a savoury barbecue dipping sauce. Partnered with a crisp green salad and grilled potatoes, this chicken kabob recipe is a super summer supper. Preheat grill to medium-high heat. Thread chicken onto skewers alternately with vegetables. Grill 3 to 4 min. on each side or until chicken is cooked through and vegetables are crisp-tender, turning frequently. Meanwhile, mix Miracle Whip and barbecue sauce until well blended. Serve with the kabobs for dipping.